After several CT scans, 3 MRI’s, and multiple rounds of intravenous antibiotics Lynne began feeling a deep despair, like there was no end in sight. Rather than relying on her usual self-sufficient move forward attitude, Lynne knew she needed support and reached out to the communities that she has been cultivating, including the Saybrook School of Mind Body Medicine. “It’s just beautiful,” she commented, referring to the outpouring of love and support that she is receiving from around the globe. She shared some of the meaningful acts of kindness that she continues to receive. As she was dealing with the excruciating pain of her condition, Lynne was simultaneously selling her condominium and moving. Packing and managing the details was inconceivable. Her real estate agent and friend managed all of the details, including packing, preparing, and selling Lynne’s home. Lynne recalls feeling overwhelmed and thankful for her generosity. When dealing with such an extreme situation it may be natural to turn the focus to oneself, yet Lynne knew that she was not going through this ordeal alone. Her husband, Dave, is by her side, accompanying her to appointments and taking care of the details of their life while she focuses on healing. Lynne reflects, “Dave needs support as well.” Lynne offers Metta, a compassion meditation, to Dave and all of the people who have been supporting her through her recovery as a way to acknowledge their kindness and participate in her healing. Lynne is grateful for the power of Western Medicine to cure her infection, however she is unable to tolerate pain medication. 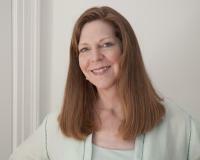 Lynne uses EFT and is particularly grateful to have learned hypnosis from Drs. Eric Willmarth, Don Moss, and Darlene Viggiano about techniques to deal with pain. She also credits meditation with keeping her pain levels lower. Lynne’s classmates and professors from Saybrook have continually supported her through this time—one professor posted updates regularly, another professor put post-it notes with her name on it to remind him to pray, and many others sent distant healing regularly. Lynne’s third, and, she hopes, final surgery on February 26 went well, and if all goes well she will be back to her usual healthy self.